I drove from Albuquerque, New Mexico to Holbrook, Arizona, and this leg has intrigued me for a while. I drove it back in 2012, but I have almost no notes or photographs for this leg, and I've been trying to remember why. It's a good, long stretch, some 240 miles. Well, now I remember. It's because almost nothing happens. Route 66 is buried under the I-40 for almost all the journey. 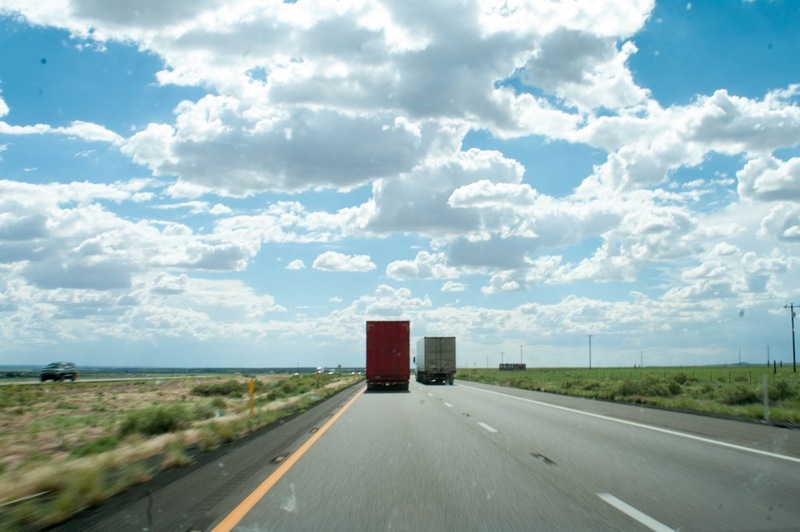 This means you're doing little more than dodging giant lorries while the endless flat Arizona landscape zips past. 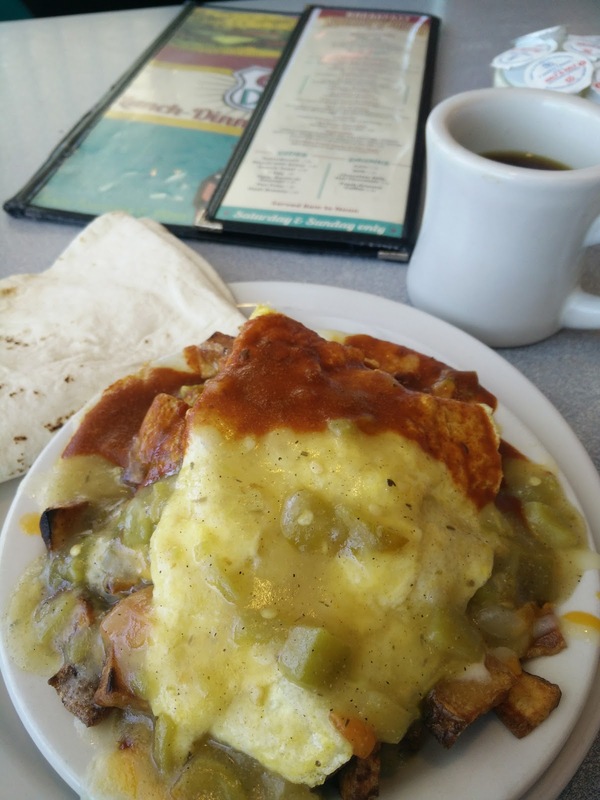 There's a few distractions - a great, authentic diner (imaginatively named the 66 Diner) in Albuquerque set me up for the day. 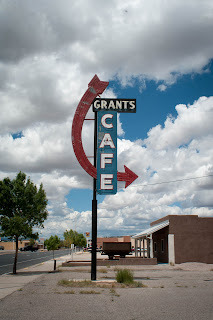 There's a short stretch of old road going through Grants, New Mexico. There's not much left in Grants any more. All along the road are empty, disintegrating motels and cafes. The I-40 bypassed all this, and modern cars can drive much further without the need for a pit stop. There's a certain post-apocalyptic feel to Grants, as I seemed to be the only car on the road. I stopped to take a few photos, but I was soon back on the I-40. The next distraction is the Continental Divide - on one side of this all rivers flow to the Atlantic, and on the other, to the Pacific. Straddling the divide is the Indian Village Trading Post, one of the most famous on this route. This is mainly because of the huge billboards advertising it start almost as soon as you leave Albuquerque. The shop itself doesn't contain much I hadn't seen before - but was cheaper than most. Indian trading posts are a feature of this area. 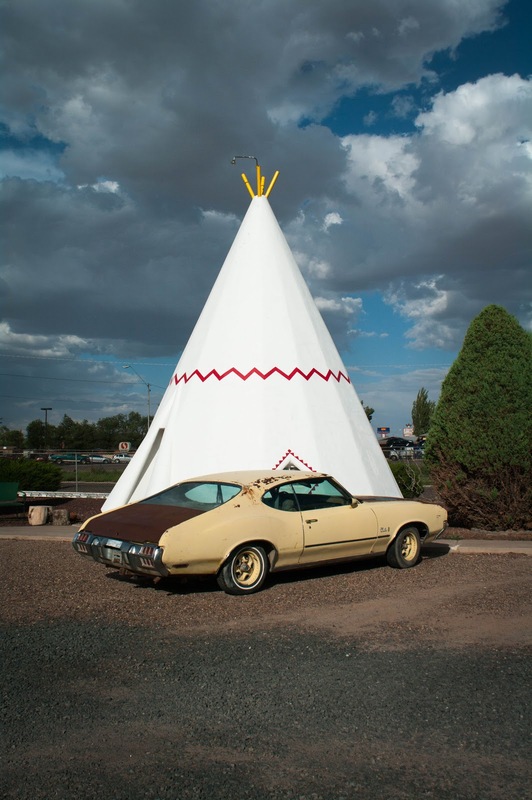 Route 66 marks the southern boundary of the Navajo Nation, an area that contains not only the huge Navajo reservation, but the Hopi, Apache and many others. This was most marked in the small town of Gallup (where last time I stopped for the night). 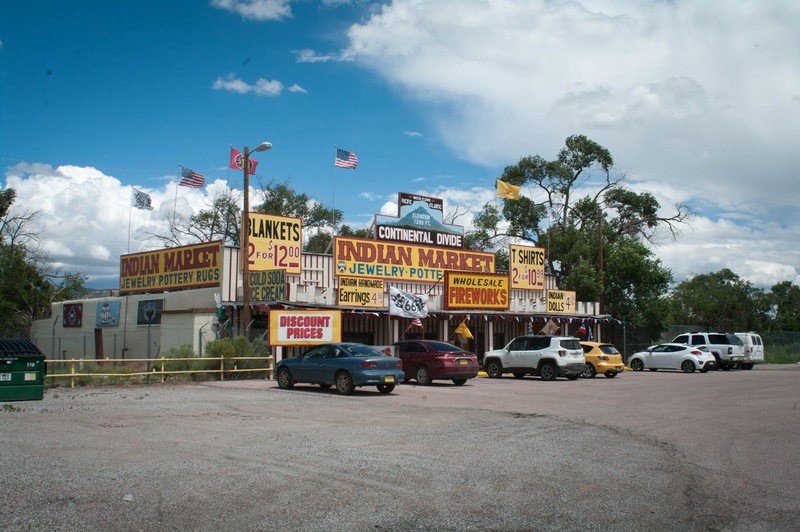 The population of this little town is 50% Indian, and most of the rest of the population is Hispanic (this is New Mexico after all). I felt that I stood out. I stopped there for a coffee, then back on the road to Holbrook. Holbrook is small (5,000 population) and would be another unremarkable Route 66 town - closed businesses and crumbling motels - except for one remarkable feature. The Wigwam Motel. Fifteen concrete Wigwams arranged in a circle, each large enough to house everything you'd expect from a motel room. There used to be many of these along Route 66 - their novelty hoping to attract drivers-by - and this is one of three remaining. The rooms were basic but fine, with their original 1950s decoration. Outside each Wigwam was a (rusty) classic car - I had a 1960s Oldsmobile Cutlass. The place was hopelessly photogenic and quite charming. Talking to the owners, almost all their custom is from Europeans, who appreciated the charm of these retro establishments. Americans, in the main, can't see beyond the primitive fittings and lack of facilities. Still, dinner was tasty and ridiculously cheap, just £9 including beer. I wish Holbrook the best of luck, it seems to be holding on - just. Well, I had exactly what I had five years ago in 2012, and nothing has changed! The 'Fender Bender' is half a 'Pile Up', and I can't imagine anyone could eat a whole portion of this hash. It was just as delicious as I remembered. I must admit, I thought this place was closed when I walked past at 7pm on a Saturday - but I tried the door, and it was open, and I'm glad it was. Fine dining this is not, but nor is it expensive. In fact, it's an absolute bargain. 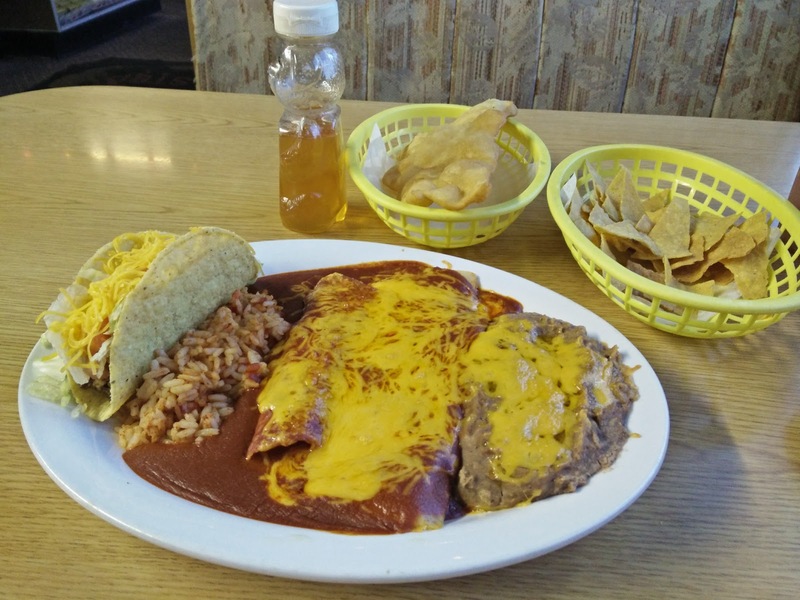 For $12 I had the combination plate and a beer, and I didn't leave hungry. Actually it was rather good. 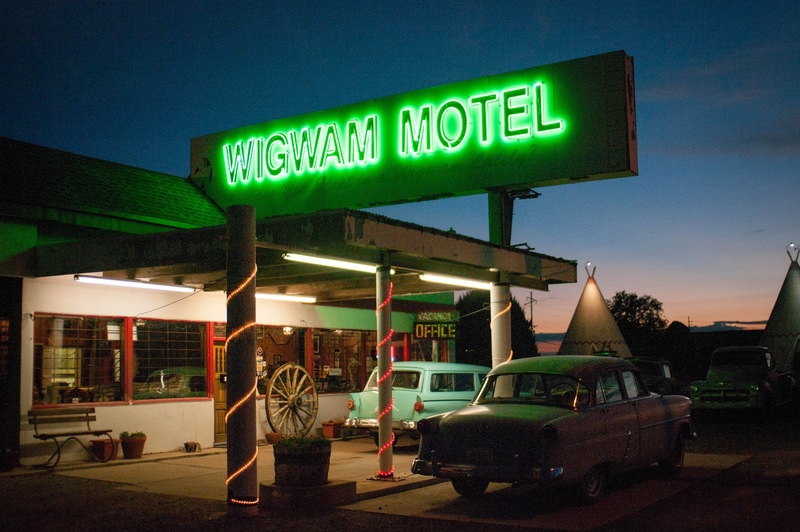 If you find yourself in Holbrook (I was at the Wigwam Motel), then you really should come here.